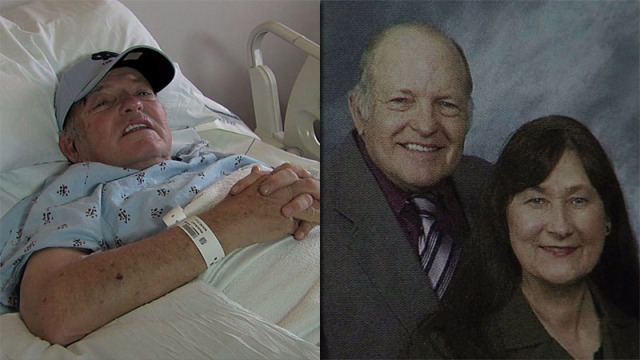 BURLINGTON, N.C. — A United States Postal Service driver FOX8 profiled in 2013 for saving someone’s life is now in need of prayers himself. Mickey Wheeley suffered bruises and bleeding to the brain Tuesday from an injury on the job. Burlington Police Department officials said the 73-year-old was delivering mail on Hanford Road when a 2008 Mazda Tribute hit his car from behind. The driver of the Tribute, Rebecca Sue Wall, 62, of Graham, was taken to Alamance Regional Medical Center with non-life-threatening injuries. FOX8 spoke exclusively to Wheeley from his bedside at UNC Hospital. Wheeley said he has worked for the USPS 29 years.”I always knew my job was a danger,” Wheeley said. “Several times, I’ve almost gotten hit. I’ve been lucky that didn’t happen, but yesterday, it did. Despite the injury, Mickey said he loves his job with the USPS. “I always dreamed of being with the post office,” he said. And he plans to return to work as soon as he can to reach his goal — 30 years of service.